As a child, I had the inside scoop on the newest and most exciting additions to the school dinner menu. I knew which days ice-burned blocks of ice cream would be forced into square sugar cones as a treat. If you were last in line on burger day, you knew you’d be forced to carry a splattered plate of sickly pink stovies to your table when the limited number of seeded buns inevitably ran out. I even heard whisperings that the custard was bulked out with bunches of toilet roll, but that turned out to be a manipulative rumour. 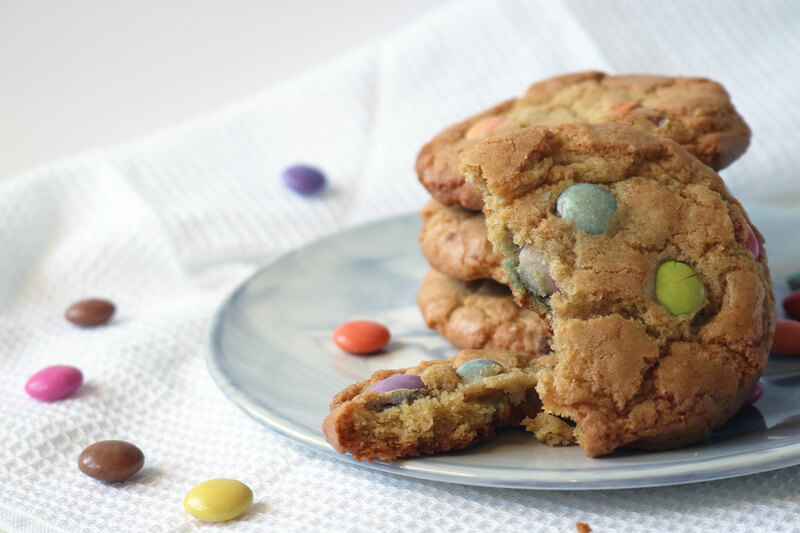 But the Smartie cookies were not a lie. They arrived one Friday, portioned out in bowls next to cartons of cheap orange juice. I’d heard the school couldn’t make you chose between a drink and a pudding and so relayed the information around that the chewy cookies could be grabbed with a carton of juice instead of our usual glasses of watery squash. When the school dinner ladies took away our cookies having pierced the tops of our orange juices, I knew my information wasn’t reliable. To be fair though, my mother worked as a cook in a St Andrew’s primary school – in all likelihood they were given starters as a precursor to their school dinners. While it took my classmates a while to get over the time I robbed them of their first school-issue Smartie cookie, by the time we arrived in secondary they were everywhere. 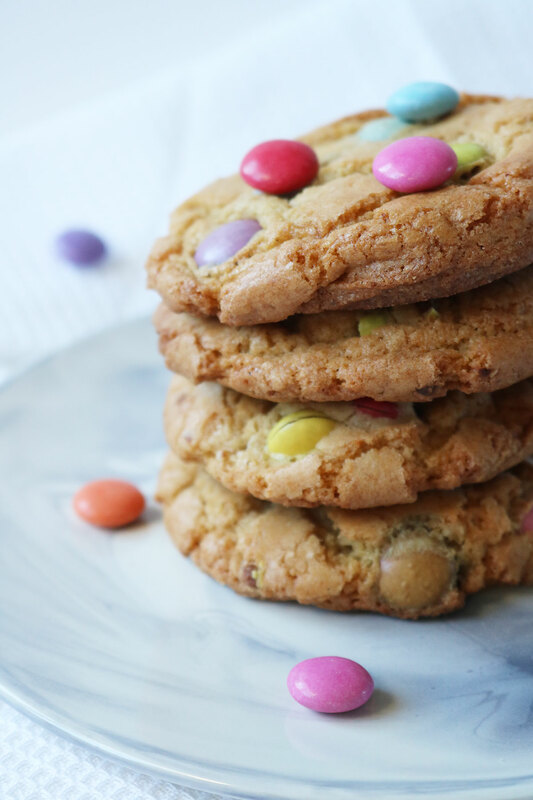 For around 50p loaded onto your school dinner card, you could choose a chocolate chip, oat and raisin or Smartie cookie from a little basket. You could get away with an accidental fumble for roughly five seconds to scope out the chewiest and softest looking ones but ultimately you would always somehow come away with a biscuit well fired around the edges, tooth-crackingly hard with notes of carbon. But at least the dinner ladies wouldn’t make you put it back if you also wanted a carton of Mr Juicy. Smartie cookies always remind me of school, even now when they’re packaged up in branded bags in the supermarket. They were the ultimate education-approved sweet treat which brought more joy that squares of iced sponge, fruit slice or even our yearly bricks of ice cream. Returning to them in my kitchen, I added milk powder for that custardy sweetness that seemed to be folded into the dough, with a good helping of vanilla paste and plenty of colourful chocolate beans. 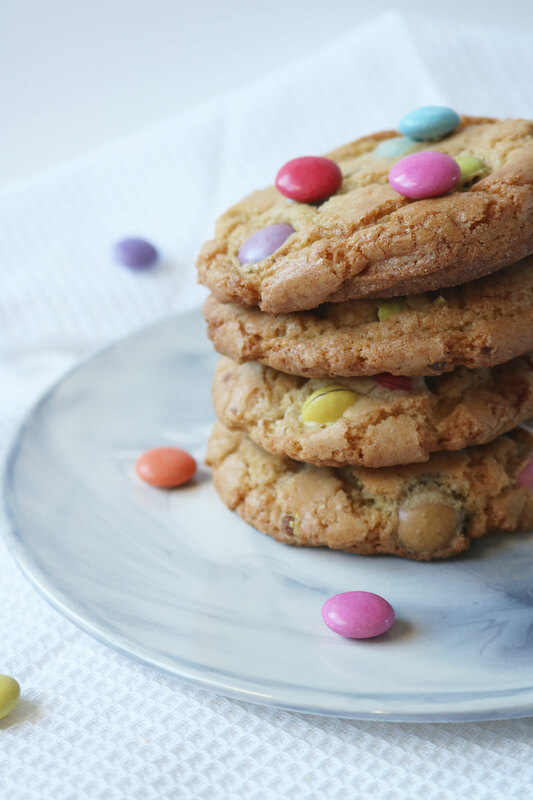 While the school version could be hit or miss, by making them at home you can ensure you win the cookie lottery every time without having to scan each one for softness and chewiness. For extra points, underbake slightly – they’ll crackle and harden as they cool so if you want a doughy cookie take them out a minute or two before the timer. Place the butter and sugars in the bowl of a stand mixer, or a large bowl if using a handheld mixer, and beat until sandy. With the mixer running, add a little egg at a time until fully combined before adding the vanilla paste. 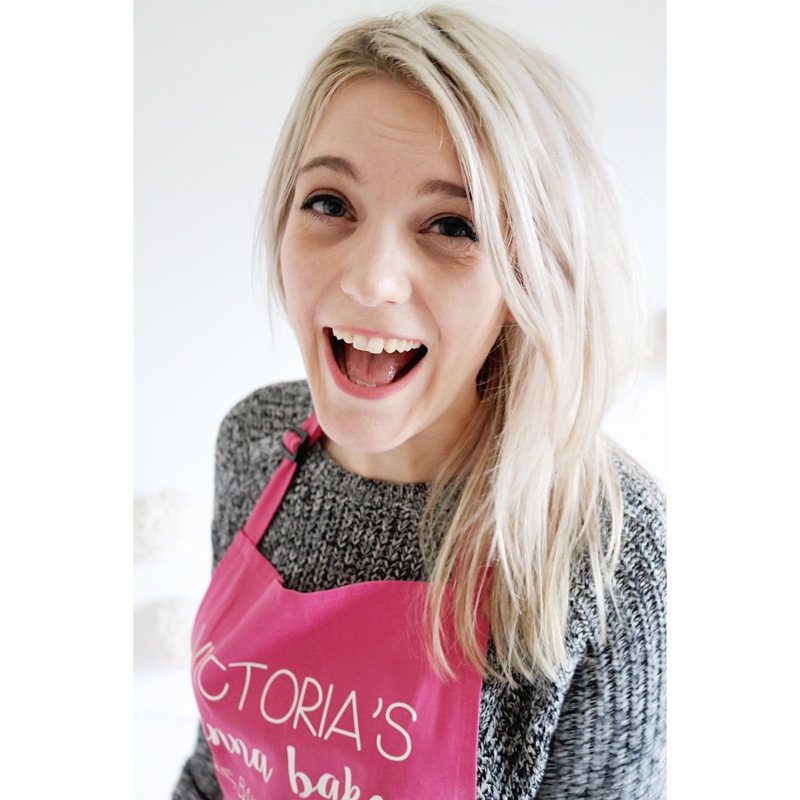 In a separate bowl, whisk together the flour, milk powder, bicarbonate and baking powders then add to the wet mix, keeping the mixer on low until fully combined. Fold in the smarties carefully (I find this easiest mixing by hand) then wrap the dough in cling film tightly. Chill for at least one hour before baking. Preheat the oven to 180oc/160oc fan and line two baking trays with baking parchment. Remove the dough from the fridge and roll into small balls about 60g in weight, making around 12 - 14 cookies. Space out evenly on the baking sheets and bake for 12-15 minutes until golden but still soft. Remove from the oven and cool for a few minutes before transferring to a wire rack to cool completely. Store in an airtight container for up to three days. oh those cookies look so beautiful and yummy. could eat one of them right about now. Thanks Elena, so could I! Wish I made a batch on standby! AAAAAAAND now I want to make cookies, they look so so good! Total throwback to fighting over them in the lunch haul lol So yummy! haha that’s ok Erin, I’ll forgive you! I know right, big drama if there was none left during morning break! Such pretty cookies! Love the pastel candies inside. Thanks Leslie, they’re so pretty with all the different colours! Thanks Leigh, I hope you enjoy them! Yeeesss these are a childhood dream come true!!!! 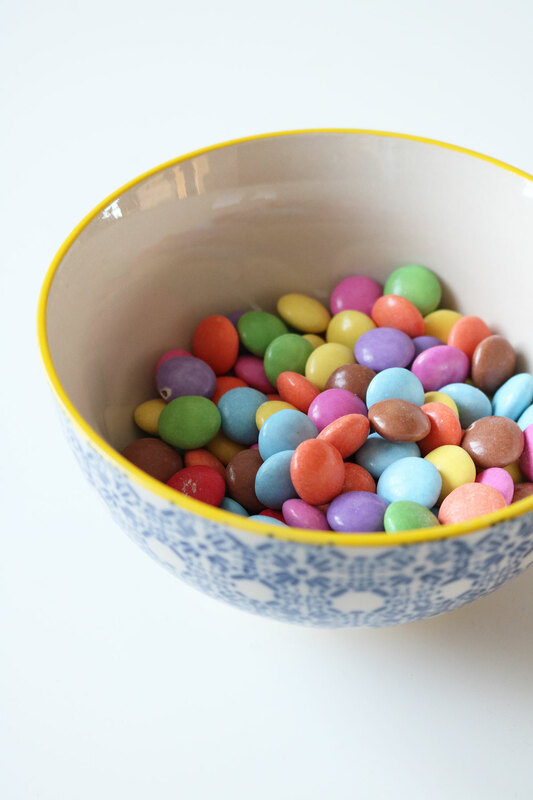 Smarties make everything just a bit more fun don’t you think?